this is a screenshot of something i saw for sale on a web page yesterday. I am not going to have a go at the company and say whose web page, because although I am outraged I do assume they commissioned this design and put it for sale in good faith. 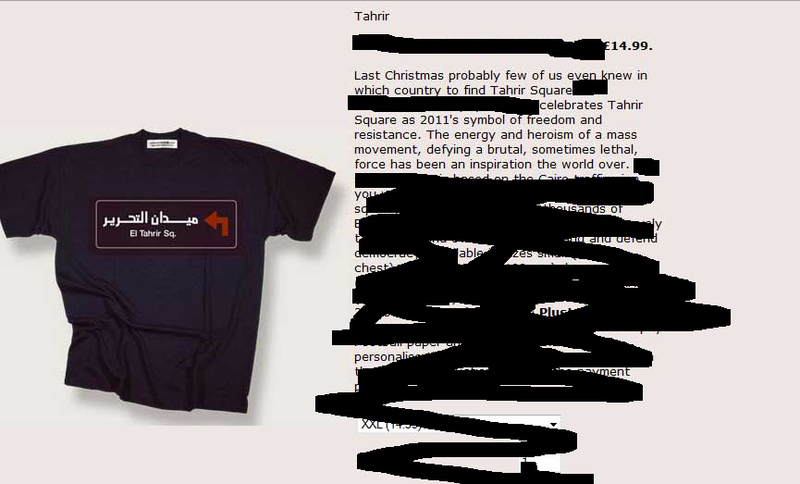 And who does not want to celebrate the “spirit of Tahrir” – ? But the reality is that Tahrir today is not a place of freedom: it is the site of an ongoing revolutionary struggle by incredibly brave people – and incredibly scared people. Although all my support is for the protestors, who are fighting to be free of dictatorship and tyranny – I am also sensitive to the many who are confused and scared by the events, who fear for their homes and livelihoods, who fear the future. I even feel for the army recruits (it is a conscript army) who are carrying out the violence – how confused they too must be! Revolutions take time. Revolutions are bloody nasty. With all the books I’ve read, I have no idea what it would be like to be in the middle of a revolution. We who are not today in Egypt, we can’t help them. Not really. We can help spread the word, so what is happening gets out there. We can try to be informed. But we can’t do much. But at the VERY LEAST we can refrain from commodifying their revolution!